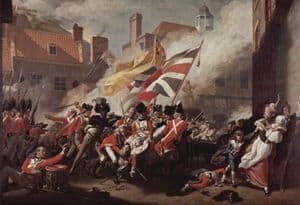 The Action of 21 July 1781 took place during the American Revolution between two French Navy frigates and a convoy of 18 British ships under protection of the Royal Navy off the harbour of Spanish River, Cape Breton, Nova Scotia (present-day Sydney, Nova Scotia). 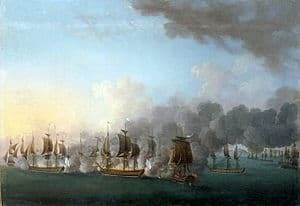 The two French frigates were led by Admiral Latouche Tréville and La Pérouse, and were ultimately victorious in the battle. The British convoy was bound for Spanish River on Cape Breton Island to pick up coal for delivery to Halifax. It was composed of 18 ships, including 9 coal-transporting ships and 4 supply ships. The escorting ships were the frigate Charlestown (28), the two sloops Allegiance (24) and Vulture (20), the armed transport Vernon (14), and another small armed ship Jack (14). The two French frigates Astrée (38), commanded by La Pérouse, and the Hermione (34), commanded by Latouche Tréville, attacked the convoy. The French severely damaged the Charlestown, which lost her mainmast and a number of her officers, including Captain Francis Evans. The French also significantly damaged Jack, which too lost her captain, and subsequently struck her colors. The engagement ended with the fall of night. 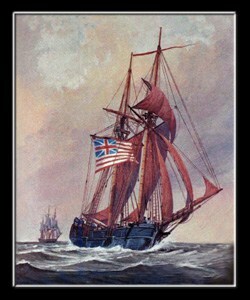 Captain George of the British ship Vulture led the damaged escorts into harbor. Six French sailors were killed and 17 British. 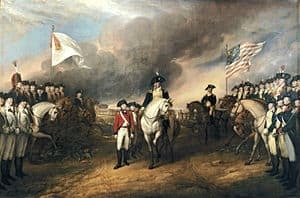 The two French commanders would become particularly famous, as Latouche Tréville became an Admiral and a hero of the Napoleonic war, and La Pérouse became a famous explorer. One of the ships, the Hermione, had brought La Fayette to the United States, and a copy is now under construction in the original docks of Rochefort.